Stranger Things season 3 won't just have new supernatural creatures for the scrappy young teens to take down and a fresh vibe thanks to a different backdrop, it will also feature a few new faces. Per Deadline, Netflix has tapped Cary Elwes and Jake Busey to join the cast of Stranger Things season 3. Elwes, whom most know from his years-ago role as the unbelievably romantic Westley (as well as the Dread Pirate Roberts and The Man in Black) in 1987's The Princess Bride, is set to play a character named Mayor Kline. Busey of From Dusk Till Dawn: The Series and Agents of S.H.I.E.L.D. fame will portray a man called Bruce. The news came via Netflix Chief Content Officer Ted Sarandos, who made the announcement while discussing the streaming service's planned international productions during the See What's Next even in Rome, Italy on Wednesday afternoon. "Our next Stranger Things could come from anywhere in the world," Sarandos said of the series. He then mentioned that "hits don't come bigger" than Stranger Things, hinting that the upcoming third season will be just as good — if not even better — as the two that came before it. While Sarandos didn't dish up any details on the new characters, we know a fair bit of information from past reports. Earlier this year, it was reported that three new characters would join Stranger Things season 3: Larry Kline, the mayor of Hawkins, described as an '80s-style slick politician" who is "pathetic and driven only by his own interests"; a news reporter named Bruce who is "outwardly sexist, overweight, and bedraggled"; and an elderly woman called Patricia Brown who spends her days gardening and "offering her advice to the neighborhood kids." It seems obvious that Elwes' Mayor Kline is Larry Kline and Busey's Bruce is, well, Bruce, so all that's left to do is find out who will play Patricia Brown. Though storylines for Stranger Things season 3 are essentially tucked away in heavily guarded vault at Netflix, and it's unclear how Mayor Kline and Bruce will fit into the overall narrative, we aren't completely without knowledge of the new batch of episodes. Series executive producer Shawn Levy noted during this year's PaleyFest LA that the third season of Stranger Things will take place in the summer and will feature an element of "poppy fun" that viewers haven't ever seen in the show before. "Season 3 is set in the summer, so right out of the gate that's a big difference," Levy said. "The first two seasons were very much school-based. This is that time of year where it's not about school. It's about the swimming pool and campfires and parades and Fourth of July and fireworks, so there's kind of a poppy fun to season 3 that's really enjoyable." The easy-going spirit and sunny disposition will be gone as soon as it came, unfortunately, as Levy mentioned the season will "inevitably turn super dark" in later episodes. Given that the shadow monster (also known as the Mind Flayer) is still lurking somewhere in the Upside Down, the idea that Stranger Things will spiral into terror isn't all that hard to believe. 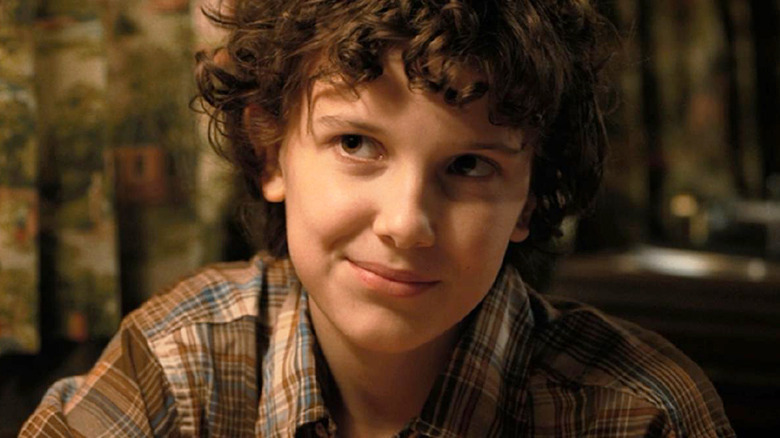 Stranger Things stars Winona Ryder as Joyce Byers, David Harbour as Jim Hopper, Finn Wolfhard as Mike Wheeler, Millie Bobby Brown as Eleven, Gaten Matarazzo as Dustin Henderson, Caleb McLaughlin as Lucas Sinclair, Natalia Dyer as Nancy Wheeler, Charlie Heaton as Jonathan Byers, Cara Buono as Karen Wheeler, Noah Schnapp as Will Byers, Sadie Sink as Maxine "Max" Mayfield, Joe Keery as Steve Harrington, and Dacre Montgomery as Billy Hargrove. In addition to season 3 introducing Cary Elwes and Jake Busey's characters, it will bring on Maya Hawke as an "alternative girl" named Robin. Stranger Things season 3 doesn't yet have a release date.